Age of my children: 3 yrs and 18 months. At the age of four I was diagnosed with Juvenile Rheumatoid Arthritis or JRA for short. At the age of twelve both my parents and I were told that I would never have children. They said that my body could not handle the extra weight and extra pressure of carrying a baby to full term. At that age you don’t really worry to much about having kids. Your still a kid yourself. But as I got older it really bothered me. When I was 17 I went to a party with some friends and ended up drinking a little. Little did I know that, that night would change my life forever. I don’t remember much after a little bit and had later come to the conclusion that I had something slipped in my drink. The next memory I have is being taken to my father by a police officer. Of course being 17 and going out without my dad telling me I could, I was in BIG trouble. But it hadn’t quite hit me yet what had happened that night. I didn’t really talk to many people over the next couple of months. Four months after the fact I found out I was pregnant with my first child. I was still in High school. I had no idea what I was going to do. Needless to say I had my first baby at 17. I had a normal pregnancy and a great delivery with no complications at all. I went into the hospital at 7 pm and had him a little past midnight that night. But with my second child, everything was completely different. In the beginning I assumed I was pregnant but was quite for sure yet. A few days after realizing that there was a possibility I was pregnant, I ended up in the ER. I was having severe cramps in my lower abdomen but knew I wasn’t on my period. My boyfriend and I sat in the ER for 7 hours for them to confirm what we already knew. We scheduled an appointment with the Pregnancy Care Center for a few days later. After they confirmed I was pregnant once again, they scheduled an ultrasound to measure just how far along I was for the following week. My assumptions were right. I was about 4 weeks and a few days pregnant. I was excited, I was having another baby after being told I would never have children. The following weeks passed with doctor appointments and more ultrasounds. I had started my new job. Unfortunately my job was about an hour drive from where I lived. The drive didn’t bother me unless morning sickness decided to kick in while I was on the road. With my first child I was barely sick at all. At about 9 weeks into my pregnancy I started cramping. I though at first it was just the normal cramping when your uterus is expanding. I was getting ready to leave for work and the cramps were still there. They didn’t hurt that bad and they didn’t bother me to much, so I thought nothing of them. I got to work and got to my desk and was putting my stuff up when an unimaginable amount of pain shot through my entire lower abdomen. I immediately told my supervisor that I needed to leave that something was wrong. I called my boyfriend and told him I was on my way home and that he needed to take me to the ER. I could tell he was worried. The entire drive home was terrible. I was cramping the entire time and to top it off I was stuck in traffic. This day couldn’t possibly get worse. Little did I know it would. I got home and one of our friends was going with us while her boyfriend watched the kids. We rushed to the hospital as fast we could. We got into the ER and got signed in. They got me triage and with in a few minutes they got back into a room. The nurses immediately get me hooked up to all the necessary machines. I had tubes and cords everywhere. With in a few minutes the doctor came in and asked what was going on. I told him that I was having severe cramps. Of course being early in the pregnancy he told me that they could be from my uterus stretching. But said that they would check everything just to be sure. The doctor checked my cervix and told me it was still closed. So he ordered an emergency ultrasound. About 30 minutes passed and the nurse came and got me for the ultrasound. I was nervous and upset about the fact that my boyfriend could not go back with me. They got me back to the room and got me up on the chair. The nurse began the ultrasound and of course I am worried out of my mind about my baby. The nurse had the screen turned to where I could what was there. Half way through the ultrasound the nurse moved the screen to where I couldn’t see anything. Finally she was done and they wheeled me back to my room. It took about 20 minutes and the doctor was in to tell us the news. He looked at both me and my boyfriend and took a deep breathe. Just by looking at the doctors face I could tell everything was not okay. Finally he looked at me and said “I’m sorry but you have a partial placental abruption.” All I could think was what did he just say, what does that mean? My boyfriend squeezed my hand and asked the doctor what he meant. He told us that the placenta that kept my innocent baby alive was pulling away from my uterus. That was what was causing my pain. He told we had about a 50 50 chance of keeping the baby and that there was nothing they could do except put me on bed rest. All I could do was cry. Was this what my doctors at age twelve was talking about? Was this what they knew would happen? I had so many questions and no answers. So I sat there and cried while the nurses got all the machines off of me and put everything away. The nurses never looked my way never even offered an I’m sorry. My boyfriend just held me and told me everything would be fine. But what if it wasn’t? The nurses gave us my discharge papers and sent us on our way. We got home and I went straight to bed. I slept the rest of the day and night. I didn’t want to move in fear that I would lose my baby. The next few days went by and I returned to work. Still worried that I was going to lose my baby, I tried to be strong. I had a doctors appointment with in a few days. And he would tell me how I was doing. We went to the doctor and he said everything was healing nicely. He said that the immediate risk was over and I could stop worrying about losing my baby. He said that he would keep a close eye on me and that I should rest much as I could. So i did as he said and rested with my feet as much as I could. So much as that my work let me have an extra chair to prop my feet on while I was working. Everything went back to normal except the fact that my morning sickness was all day long now. I couldn’t eat anything with out getting sick. It didn’t matter what it was. So I went through the rest of my pregnancy normally. The weeks passed and we found out we were having another little boy. We were so happy. OMG! Please not again. All I could think was, God please don’t do this to me again. We are so close to having him please don’t take him now. We have come this far. So we went home and got our bags and headed for the hospital. When we got there they admitted me and got me to my room. They got me hooked to all the machines and got my baby’s heart beat on the monitor. A little over and hour and the nurse came in and told us I wouldn’t be going home tonight. The nurses said that they didn’t feel comfortable letting me go home with my sons heart beat dropping like it was. So we got settled in for a long night. Not only were they keeping in the hospital over night but the next morning the were inducing my labor. So we tired to get as much sleep as we could. 6 o’clock came fast and they were hooking pitocin up to my IV line. I went back to sleep and woke up a few hours later. The nurses came in to check me and said that the pitocin was doing what it should but they wanted to increase the dosage. Everything to be going normal. At about 11 o’clock my doctor came in to break my water and check me. He said that I was dilating normally and that everything to be fine. What I didn’t know was that everything was not fine. At about 1 o’clock my boyfriend and one of my friends that was going to be in the room with me came in. My friend had tears rolling down her face and was bawling her eyes out. While I was up stairs getting ready to have a baby my best friends (my sons godfather) grandfather had passed away. I was so upset and didn’t know what to say to him. But I knew that I couldn’t over work my self because I could put my baby in distress. About that time I got my epidural and went back to sleep for a while. The next thing I remember is waking up to this sharp pain in between my legs. I ignored it for a while, thinking that it was just the pressure of him moving down. About two hours later the pain was still there only worse. I finally told my friend that a nurse needed to come in here and check me. She went and got a nurse and the nurse said I was only at a 4. She had the anesthesiologist come in and check everything. Everything was fine but they ended up giving me the medicine they use for a spinal tap. So I dealt with the pain for a little bit. Finally I had had enough. They gave me an epidural as well as medicine for a spinal tap and it was supposed to numb all the pain, not cause it. So I called the nurse and she had the anesthesiologist come in and check out my epidural line once again. She checked my line and said that everything was fine. I told her everything was not fine. But being that i was in pain she did an ice test on me. She ran an ice cube across my stomach and down both legs and asked me each time if I could feel the ice. And each time I told her I couldn’t feel anything. So she finally put the ice right in between my legs and asked me if I could feel the ice. “Yes that is cold!” I said to her. She simply told me that I had what they called a hot spot and they couldn’t do anything to help it. So basically their stuff was not working properly and I had to deal with it. WOW! So I dealt with the pain. After about an hour I called the nurse again and told I was feeling a lot of pressure. She checked me and said that I was only at a 5. She left the room and about 30 minutes later I was calling her back in. She checked me once again and this time I was at a 7. I was so close and by this time the pain was so bad that I was screaming. I had never felt so much pain in my life. It honestly felt worse then the actual contractions. About 3 minutes later I was calling the nurse to come and check me. The nurse refused to come and check me and told my friend that she was not going to check me every time I felt a little bit pf pressure. Needless to say My friend ended up getting the nurse to check me one last time. This time to her surprise I was at a full 10 cm dilated. She told me she was going to call my doctor. She had been gone about 3 minutes and I was yelling over the intercom that my baby was coming out right now. I knew I needed to push and wanted to so badly. But the nurses had other plans. Instead of me pushing they had me wait until my doctor arrived to deliver my son. Well my son as well had other plans and was trying to be born right then and there. 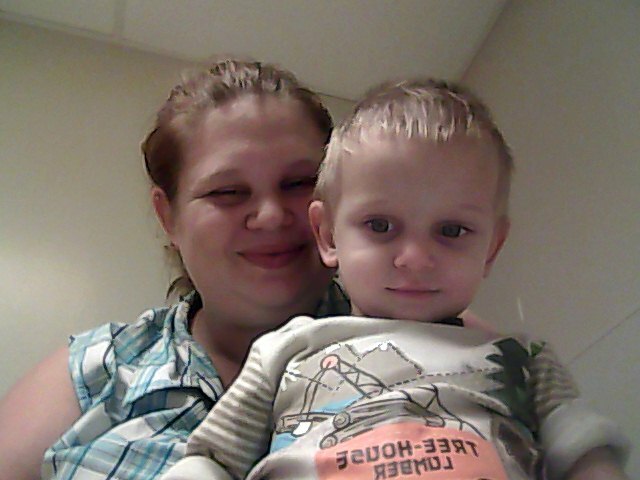 So instead of the nurses delivering my son they put their hand over his head and held his head inside of me until my doctor arrived, which was about 5 minutes later. Finally my doctor showed up and was getting his gear on. He looked around and couldn’t believe that the nurses hadn’t deliver him yet. Finally my doctor sat down in front of me ready to deliver. I looked at my doctor and asked “CAN I PUSH NOW?!”. He laughed at me and told me yes. It took me one and a half pushes to get my son out. With as many problems as I had during his pregnancy, my son came out to be perfectly healthy. I can honestly say, he pregnancy and birth was not at all what I expected. I guess it’s true when they say every pregnancy and birth is different. Your son is beautiful. I’m so happy for you that you have two sons after being told you could not have children. I was very unhappy with my hospital birth and the way they treated me there. I have two sons too, and when I decide to have #3, I’m having a midwife and doula. They will support my emotional needs and give me the individuel medical care they just can’t give you in a hospital. They held the babies head in? thats crazy! theyre trained to deal with babies you’d think they would just deliver. Omg. Congratulations on having two children after being told you cant. A womans body truely is amazing.